Canadian Geographic Education has launched its first-ever Google Earth Voyager story, which addresses a dark chapter in Canada’s history: the residential school system. Canada’s residential school system was a government-sponsored, church-run network of boarding schools aimed at assimilating Indigenous children by taking them away from their families and forcibly erasing their cultural identity. The first residential school opened its doors in 1831 and the last one, Gordon's Residential School in Saskatchewan, closed in 1996. Trapped in the system, children suffered emotional, mental and physical trauma. Many children never returned home, dying from disease or during attempts to run away. Today, residential school survivors and their families are still struggling to heal. The aim of this Google Earth Voyager story is to educate, raise awareness and encourage all Canadians to learn more about residential schools, as well as to inspire Indigenous and non-Indigenous people to work together towards reconciliation. The Google Earth Voyager story weaves photographs and video links with firsthand accounts from residential school survivors. Quotes are taken directly from the Truth and Reconciliation Commission report The Survivors Speak, which is filled with raw and moving testimonies about the horrors of the residential school experience. The story is divided into four chapters: the first provides background and historical context, the second offers a glimpse at life inside the schools, the third examines the damaging effects of the system, and, finally, the fourth looks toward the future. The story is available worldwide in both English and French, as well as in six other languages. 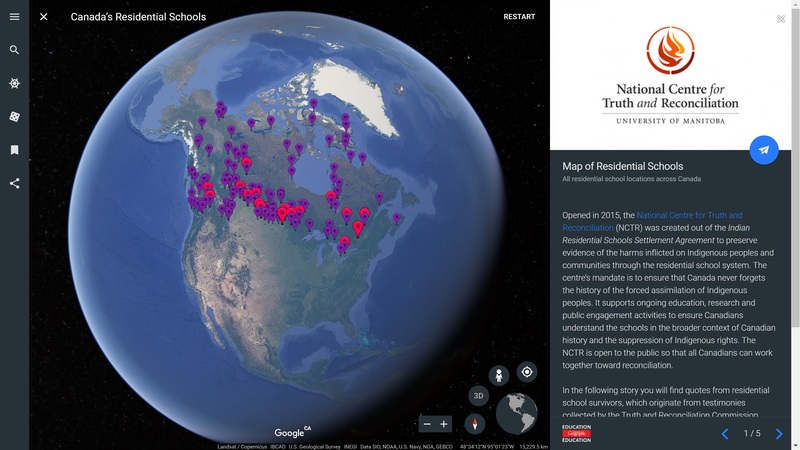 Canadian Geographic gratefully acknowledges the support of The National Centre for Truth and Reconciliation, which provided invaluable editorial input and supplied the data necessary to create the national map at the centre of the residential school story. As viewers read the story, they will be taken to different locations in Canada that were integral to the residential school system. Each location corresponds to a story panel, providing viewers with an aerial or street view of the present-day landscape. In the story panel, there are historical photographs, videos and information about the significance of each location. Every point is different, from seemingly innocuous-looking school buildings to barren and remote landscapes. Canadian Geographic Education encourages teachers to make use of this story as an educational resource and as a launching off point for important discussions with their students. The November/December 2017 issue of Canadian Geographic magazine celebrates Indigenous Peoples in Canada and highlights their stories and experiences. Find it on newsstands now.